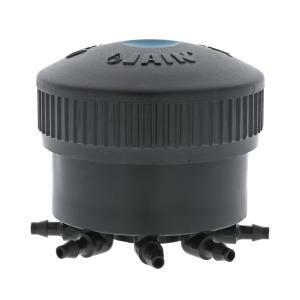 The highly sought after Octa-Bubbler is manufactured to be UV and chemical resistant with a non corrosive plastic material for stable performance. The Octa-Bubbler has eight self cleaning, pressure compensating ports. 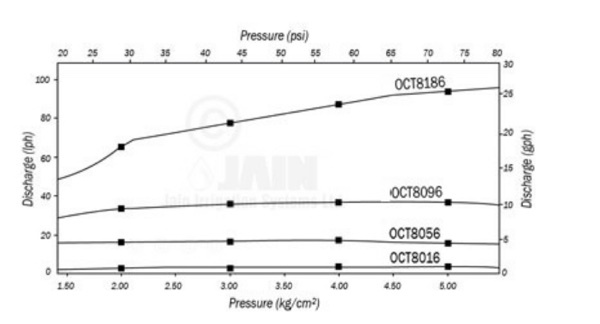 The flow rate listed is the flow rate of each port. For example, the Blue unit is a 2 GPH unit, this means that each of the 8 ports will deliver 2 GPH. Each port has a 1/4" barb that swivels 180° to provide flexibility of positioning the extension tubing in any direction. Flow control devices can be interchanged in a single unit to facilitate variable flow rates in one Octa-Bubbler. Precision molded liquid silicone rubber diaphragm ensures pressure compensation, uniform water application and long lasting high quality performance. Ideal for converting sprinkler systems to low flow drip irrigation, because it is designed to apply the amount of water the plants need during the time the sprinkler zone operates. Designed for converting sprinkler risers to low flow irrigation. Can be used to irrigate landscaped areas of road dividers, shrub island between turfs and lawns, trees, flowers and ground cover planting beds where lateral requires to run for longer length and irrigation time is a limitation.